All humans ask many of the same big, important, and often unanswerable questions about life: Where did we come from? What is the meaning of life, the universe, and everything? 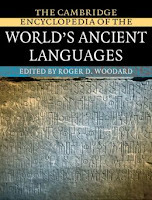 And where can I find a basic grammatical description of nearly every ancient language I could imagine in one volume? Be honest, did you even know that all of these languages existed? 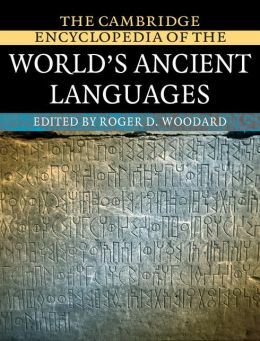 This is a helpful resource for those who are curious about ancient languages and who have a linguistic bent. I want to emphasize that last point: this is not the most accessible volume if you have not done a lot of language work. That said, the materials on the history and literature of the languages as well as the bibliographies will still be useful even for the uninitiated. There have been many criticisms of the volume, and if you are going to use it in any serious way then you might want to familiarize yourself with them. Katz points to issues in both concept and execution. He is writing his review for an audience of classicists, where his critiques of the concept of the encyclopedia may be valid. I suspect for linguists, however, that the volume might be immune to some of these points. Klein focuses on some of the errors in the work. Both of these reviewers point to problems in the chapter on Attic Greek. Klein also finds errors and difficulties in the chapters on Indo-European, Sabellic Languages, Ancient Nordic, Ancient Chinese, Old Tamil, Continental Celtic, and others. Daniel criticizes the book as a whole, but commends the individual chapters. While the work may not be beyond criticism (what is? ), I'd recommend taking it off the shelf of your library and playing around with it a bit. For the linguistically inclined it is a great way to flirt with new and interesting ancient languages. And who knows where that flirtation might lead? Note: You can also check out the smaller volumes that draw from this encyclopedia, like The Ancient Languages of Mesopotamia, Egypt, and Aksum. Nice post, and no, I did not know about a few of these. Great way to work in the Adams reference, by the way, and since D.A., can anyone ask the ultimate question with an entirely straight face? One very serious criticism is: Where's the ancient Klingon? or Romulan? Isn't it time for this blatant humanocentrism to end?